Schapelle Corby is now mentally ill, and due to the strong medication she is taking for this, she is also physically deteriorating. 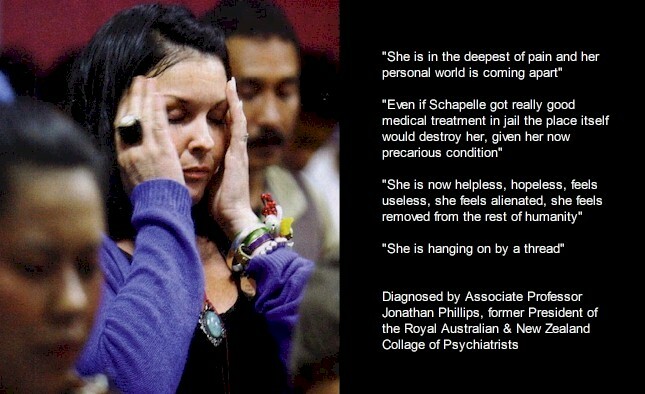 She was diagnosed in August 2009, by one of Australia's most eminent psychiatrists, Dr Jonathan Phillips, MB BS FRANZCP. Her very presence in a squalid prison constitutes a gross abuse of her human rights. This report examines her deteriorating condition, in the face of the ongoing indifference of her own government. "Schapelle Corby is suffering a slow and torturous death, devoid of human rights, and devoid of any protection by her government."